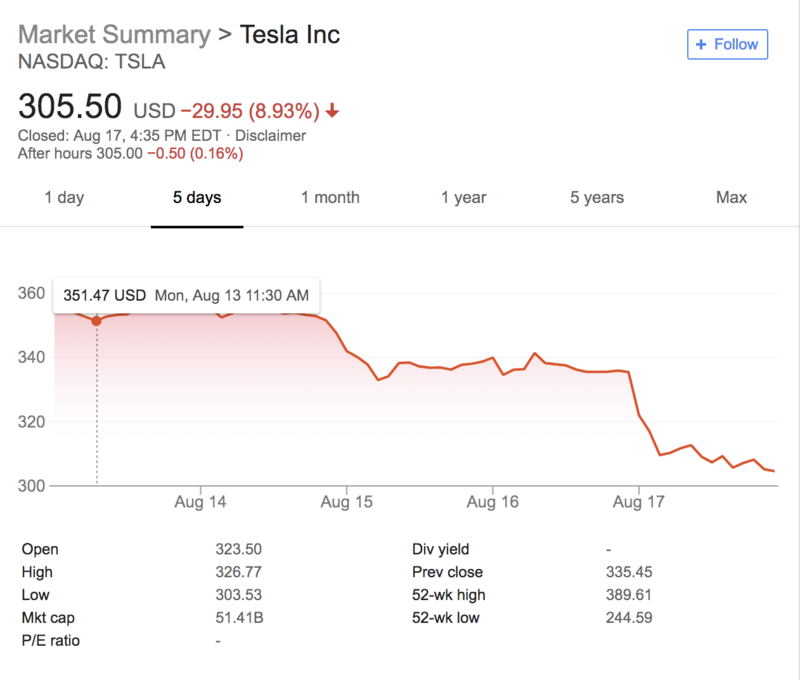 Over the last five days, Tesla shareholders watched the value of their stock decline by roughly 16 percent and saw nearly $8 billion in value erased, as the company’s celebrity chief executive, Elon Musk, had what amounts to a very public breakdown. However, Musk is not the only person responsible for the collapse of Tesla’s stock price. As The New York Times article which precipitated the latest slide in Tesla’s value on the public markets makes clear, the company’s board is also to blame. For months, Musk has been showing signs of strain (generously speaking), and has been accused of making questionable decisions to drive growth and stifle criticism or dissent at the revolutionary electric vehicle company he founded. During that time, as Shira Ovide notes in her piece from Bloomberg, Tesla’s board (primarily composed of Musk’s friends, relatives and initial investors) took no public steps to control or manage the situation. Some Tesla board members are reportedly concerned about Elon Musk's workload and his use of Ambien. Privately and on background the board (or certain members) expressed concern over Musk’s recent behavior, drug use (both medicinal and recreational) and Twitter habits. Those concerns should have been aired at the board level and the company’s directors should have exercised their ability to manage the mercurial Musk as his public actions became increasingly unmoored. At any of those moments the board could have stepped in and demanded that Musk face the consequences for actions that cost his company billions of dollars. They did not, and now Tesla’s position is more precarious than ever. The Securities and Exchange Commission is investigating Musk for his public statements around privatization plans for Tesla that may or may not have been real. It’s another distraction for the company’s chief executive at a time when he is already under tremendous pressure to meet production targets for the company’s troubled Model 3 rollout (even as it begins to hit its targets). The problem is that Musk’s cult of personality is so intertwined with Tesla’s corporate identity, there’s a fear that as Musk goes so goes Tesla. That’s no way to run a business, and it’s no way to ensure long-term value for shareholders (either as a public or private company). Ultimately the board at Tesla needs to step in and take a more active role in overseeing the company, before the next decision they find themselves confronted with is the company’s liquidation.